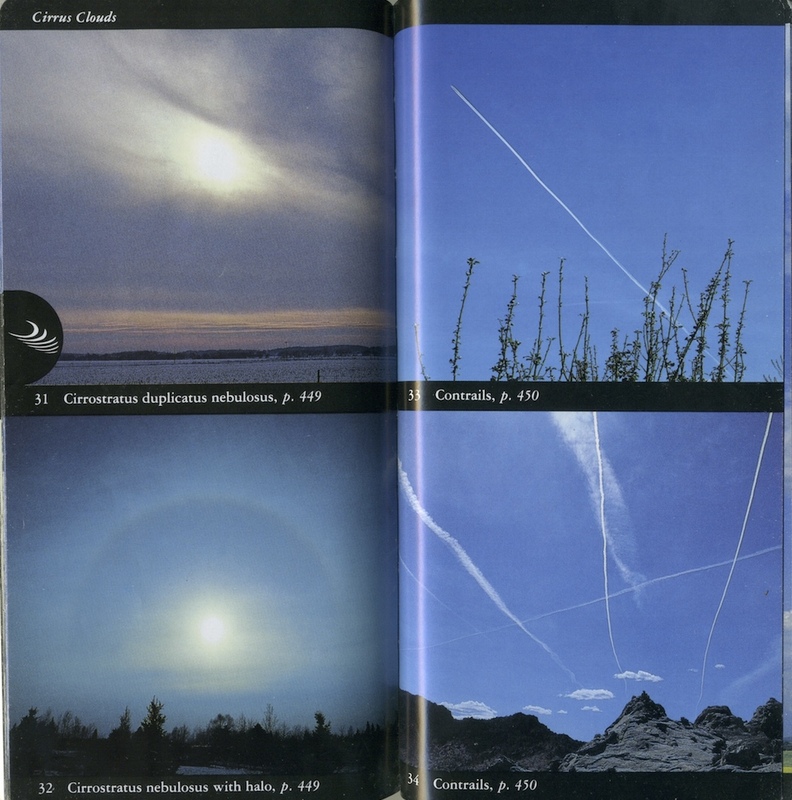 Discussion in 'Contrails and Chemtrails' started by Mick West, Feb 28, 2014. So that's all still correct information? As far as I could tell. Didn't got through it point by point though. p.s. I think they've twigged, they get more "hits" through MB. Please explain to me how contrails emitt from the outer side tail section of an airplane as shown in the below video. There is always a gap that appears clear between the engine exhaust nozzles and the beginning of the visible contrails. This gap will vary in length (due to specific conditions aloft), and of course the angle of viewing (perspective) will give illusions, based on the geometry of the airframe itself. As already advised, if you line-up the trail with the rest of the aircraft, you will find they match the position of the engines on the wing. I'm suprised (or not) to learn non-persistent trails are also theorised as chemtrails. Also, in higher resolution photographs you can often see the contrail forming in front of the rear tail wings horizontal stabilizer. This pic is not of the same plane as in the video. ... in front of the rare tail wings. You debunkers and your fancy facts. RE: This specific video, and the uploader (YouTube username 'Stormy13Wizard13'), I've been posting quite a bit, there. Perhaps naively thought I could actually make a difference using some real polite comments. Anyone else care to join in? Rather than make screenshots (I will on request), those that can view the video AT YouTube will see what I mean. (PS: I'm "767Captain" there. Same avatar, just for recognition ease). Added another one to my physical collection. Had a nice image of multiple spreading contrails. One problem I have in telling people that contrails can actually persist, and can even spread out to cover the sky, is that people tend to be suspicious of random people on the internet. 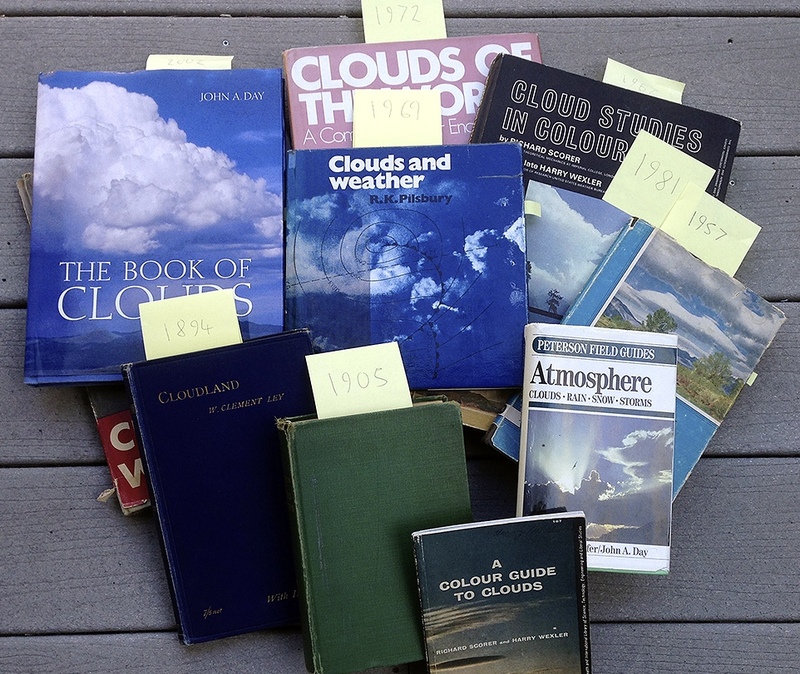 So I decided to simply let 70 years of books on clouds speak for themselves. 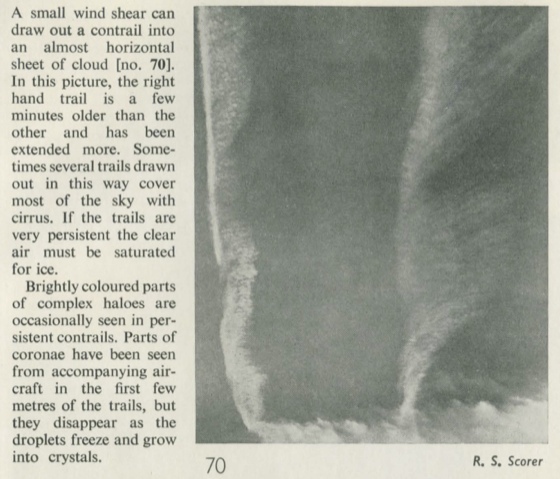 Result: Every single book on clouds that I could find for the last 70 years says that contrails can persist for hours. So next time some random guy on the internet tells you contrails can't persist and spread, then ask them why 70 years of books on clouds say the opposite. 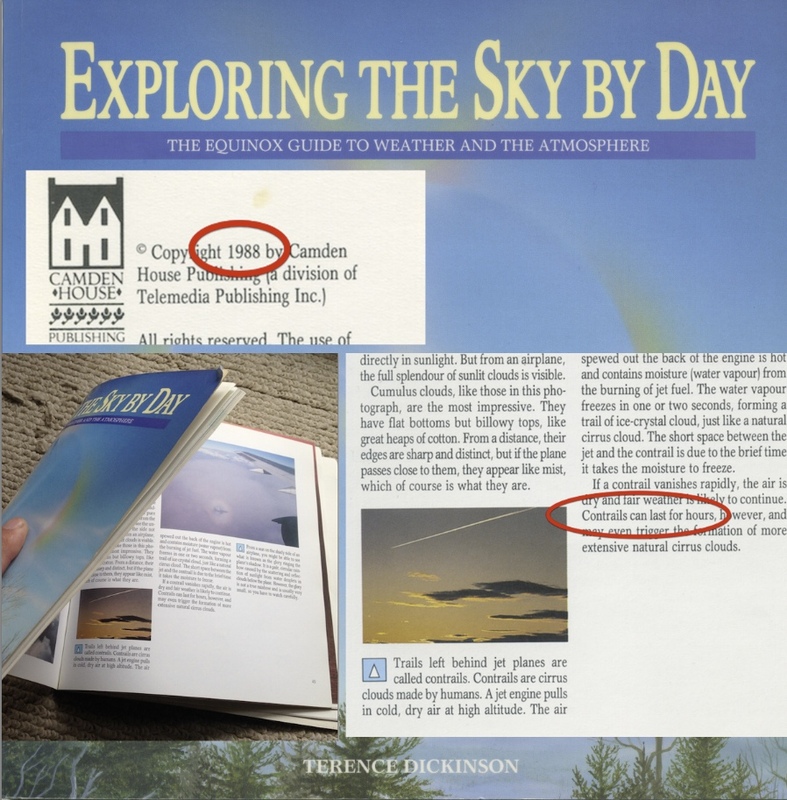 http://books.google.com/books?id=SBM8AAAAMAAJ&q=contrails "last for several hours"
Looks unaltered to me. And books from the same publisher sometimes had the same ISBN. Plus, there's many other books. His copy had a page missing and some rips. That's all. Several people have copies of this book. Theres 17 for sale for different places on Amazon right now. Mostly ex-library. There are probably some still in libraries. Here's a video of my book. Does it look fake? According to The Library of Congress the ISBN 0811719618 was issued to two different books. So there's no real evidence of fraud on that issue. As for the physical alterations it looks like a poor attempt to make it look like the book has been altered. Unless the claimed other altered editions can be produced as evidence, I'd say this is another Tanker Enemy fake. The existence of Mick's copy without the evidence of the extra pages, the tears or the tape reinforces the likelihood of it being a fake. Top it off with Tanker Enemy being considered an unreliable source by sites like ATS and Godlike Productions, homes to many chemtrail advocates, and the chances of the video being accurate are even further diminished. The other thing that has to considered is that the copy hasn't been altered but is a production run mistake where partial pages have made it through the biding process and missed by quality control. I used to occasionally get something similar when I took the newspaper. And then there's the issue of all the other books that say the same thing, and the total absence of books that say anything else. Thanks for the video and the clarification . I will order one myself . I cleaned up the sound a bit and added a walking bass line in the background. Anything you can do to remove that fake accent? Audio sounds a bit boomy now. I know it was rather crappy audio before, but I think I prefer the original. No worries though. "Two fighters were locked in combat in the bitterly cold air of the sub-stratosphere nearly six miles above the steaming, fetid jungles of Guadalcanal. As they turned and swooped, each trying to bring his guns upon the other, their engine exhausts wove an intricate pattern of gleaming white vapor trails against the deep blue background of the tropical sky.."
Quite possibly the oldest account of a contrail I think I've ever seen. The article was titled "Cloud Formation by Supercharged Plane" and it appeared initially in US Air Service magazine in July 1921 and was also sampled in the Monthly Weather Review, July 1921. "After 20 minutes the streamer had drifted and spread until it merged indistinguishably with other cirrus clouds visible." Monthly Weather Review, July 1921.
which has a nearly 100 year old account of contrails. In the autumn of 1918, in an account of Captain Ward S. Wells, Army Medical Corps, who was serving with the 60th Infantry, 5th Division, American Expeditionary Force, during the Meuse-Argonne campaign. Our attention was first drawn to the sky by the sudden appearance of several strange and startling clouds–long, graceful, looping ribbons of white. These were tapering to a point at one end and at the other where they dissolved into nothingness 60 degrees across the sky, were about as broad as the width of a finger held arm’s distance from the eye. On close observation we noticed some distance ahead of each cloud point the tiny speck of a chasse [sic] plane…. [N]ever before had I seen a plane writing in white upon the blue slate of sky. I didn't include these because they are just individual observations, not scientific accounts of what to expect. But of course they are still very interesting. 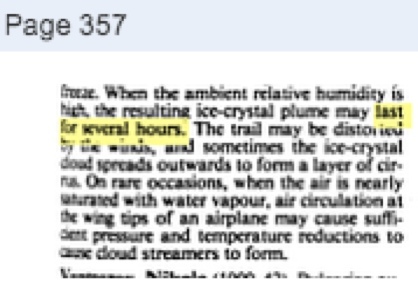 I see the most common misconception as "atmospheric conditions that lead to contrails are rare". we have cirrus clouds here more often than not, so the atmospheric conditions are not at all rare. Yeah, you are "spot-on" (as the British idiom goes). I was watching a program originally aired on 'SKY1' in the UK, but now easily available to stream on-line. I wanted my mother to watch, because she enjoys ABC (the U.S. ABC) "The Amazing Race" because, as she notes: "I get to see the world". Well, the 'SKY1' program is titled "An Idiot Abroad". Ricky Gervais, Stephen Merchant and Karl Pilkerton (Karl, the "hapless adventurer"!). 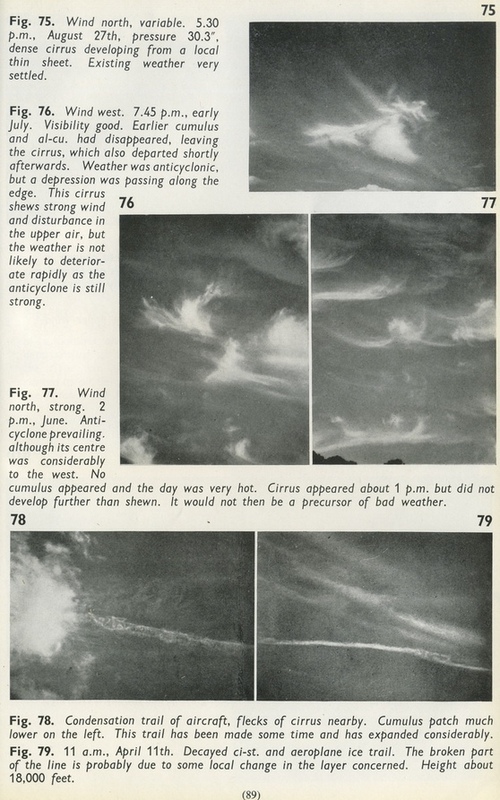 During THIS show (which travels the world) there are many, many scenes of the sky, in VERY remote areas, showing the SAME sorts of typical cirrus clouds that are, really, just part of normal meteorological events. Ooops....am I responsible for this? And that's not the end of it! When in this book there are references to the trails shadows it is used a very recent term: "distrail". This is a brand-new expression and not even onEtymonline.com is possible to find it. So it's manifest that this word, coming from N.A.S.A. 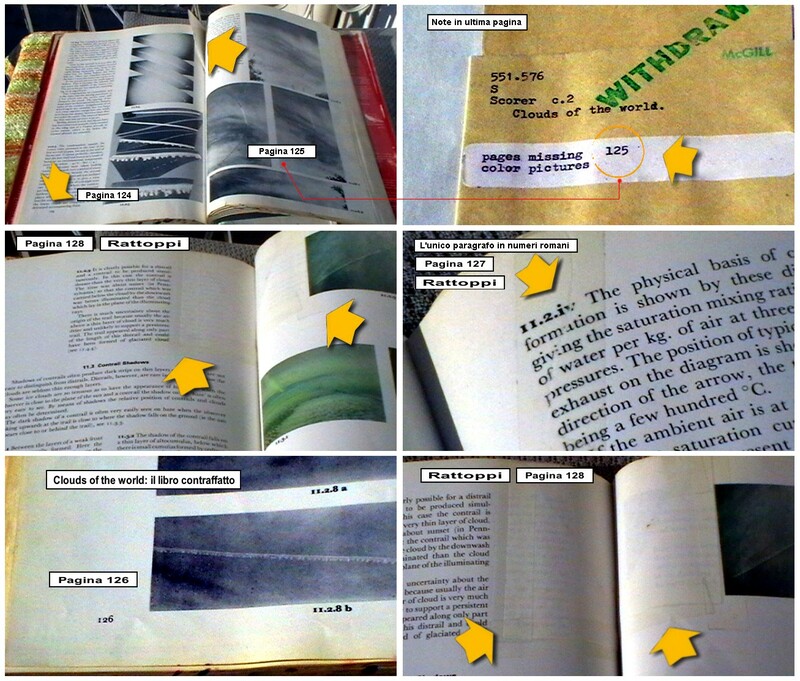 theories, cannot be part of a book printed in the 1972! 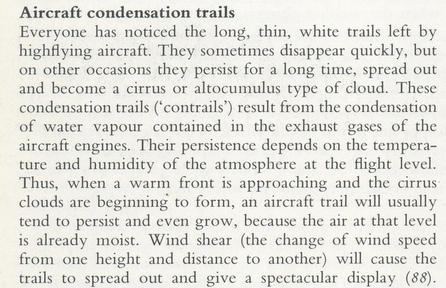 Even the "cloud" idiom, used to define condensation trails is very modern expression of this century. [ won't cut and paste ] ... observed on September 23, 1952. What does the 0.159 refer to?